How many times have you entered your GP Password with CAPSLOCK on and got a Login Error Message? Well I do, most times. I decided to write a code which would remind me of this at least once, like any other application. Thought I would share that with all who need it. 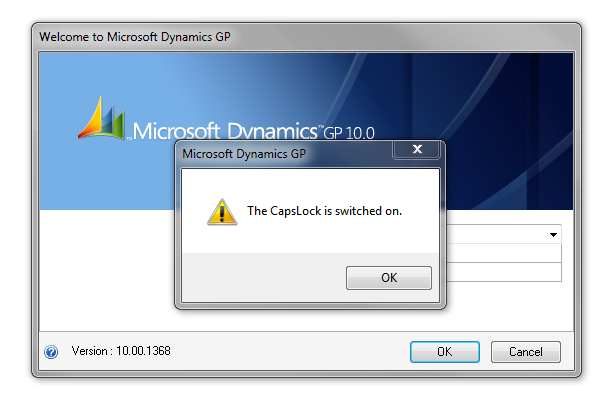 This particular code will display a message box like below when you launch GP with CAPSLOCK key ON. This message will also be shown when you try to change the User after logged on to GP thru’ different User Credential. 2. This code is written on Microsoft Dynamics GP 10.0 SP4. I have not tested this on other Major as well as Minor versions. Find your free package here: CapsLock Login Message Package File. This entry was posted in Modifier, VBA. Bookmark the permalink.